An inspiration from the swinging 60s was seen on the NYFW runway at Anna Sui’s show. Makeup artist PatMcGrath revamped the 60s looks with an unique touch of her own. 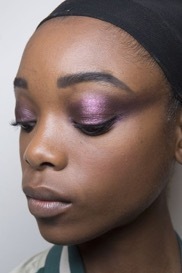 Floating eyeliner by using vibrant pinks and violets were seen and lips were kept super glossy with dramatic lashes. This look is going to be the IT look for Fall 2018 for sure amongst the fashion and beauty industry. The smokey eye got an update at Christin Siriano show where vibrant pink shadows with blue liner on the bottom with ultra-glossy lips were the highlight. There's something effortless and cool about the blurry, faded look. To get it, makeup artists are ditching bold, bright hues in favor of lipsticks that enhance their client's natural lip color by the use of glosses and lip plumpers. 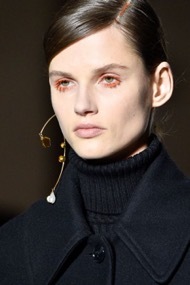 Grace Jones-inspired color block eye makeup and regal low ponytails accessorized with three barrettes. As models walked down the show at Dries Van Noten in Paris, there was a major beauty moment that stood out: thick, colored lashes in gorgeous jewel-toned hues. Makeup artist Peter Phillips applied eight different shades, some of which he custom-mixed for the occasion. All the models had big, colored lashes. Chemical yellow, bright orange, deep purple, shocking blue, chartreuse, billiard green, and brick colours were used to create these looks. Marc Jacobs brought back the 80s drama in a major way. For his fall 2018 runway show, the designer's cues for hair and makeup went back to the decade's near-neon hues and full-on glamour. There was no place for effortless or natural here—Jacobs' models this season were all about being done-up. The '80s vibes continued on the makeup front with dramatic eyes. Lead makeup artist Diane Kendal worked with nine different jewel-toned eyeshadows to coordinate with each models' outfit and hat. She pressed glitter shadow into the eyes with her fingertips, blending outward past the brows, then intensifying with gel liner and liquid liner. Punk rock smoky eye meets glamour. Instead of the usual greys and blacks, this dramatic look was created using warm metallic bronzes and gold. Rock n’ roll tousled waves and sunset-inspired smoky eyes were the USP of the whole look. So get your hands on the cult beauty products of the season and be Fall ready in no time! Toronto loves beauty, here are some of our top picks to get your beauty on this Fall/Winter. Mix Beauty Lab is one of Toronto’s sought-after beauty spots in Toronto. They have an array of services ranging from various facial treatments such as microcurrent therapy, dermaplaining and so on, brow services, tanning, lashes, nail studio services, hair removal and makeup. 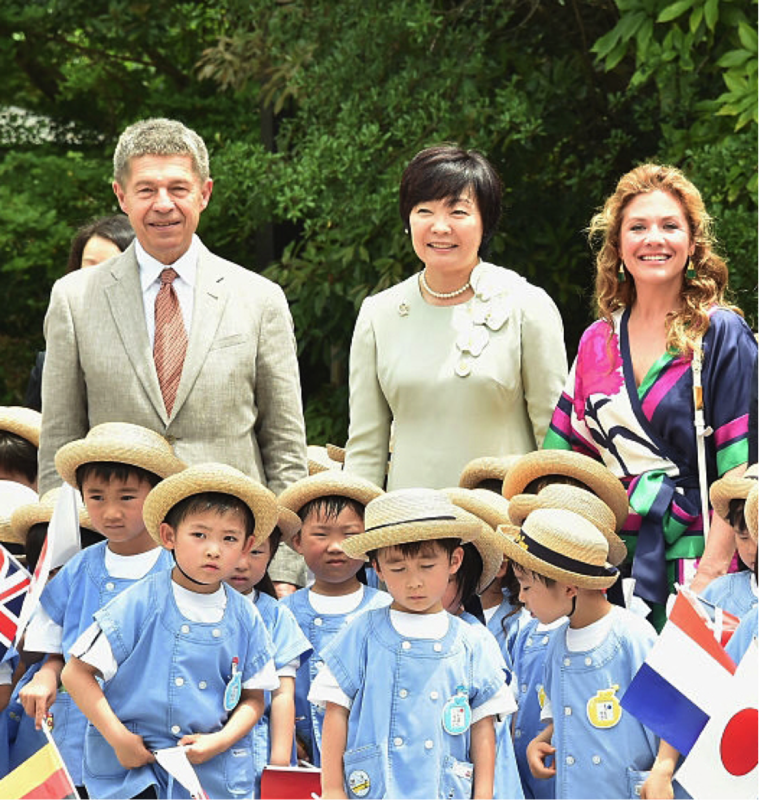 But their crown jewel is their custom beauty products. Mix Beauty Lab mixes and creates their own lipstick, lip-gloss, foundation and even customizes their very own eye shadow palettes. Their in-house colour lab creates signature custom bottled foundations as per your skin tone. You can create any colour lipstick or lip-gloss and foundations using all-natural ingredients. The foundations can even contain specialized skincare ingredients and an SPF. Want to get rid of cellulite and access fluid well Marina has one of the only systems in Toronto that can do this called Starvac. This is a non-invasive technology from France that uses suction and deep tissue massage to activate lymphatic drainage and destroy cellulite causing fibres. Not only does this feel amazing, you look great afterwards. This Toronto aesthetic and cellulite clinic is the product of the well-known expert and lecturer in the area of Aesthetic Medicine Marina Vashkevich. They specialize in non-invasive treatments and Marina always uses a combination of therapies tailored to each person in one visit. Our second favourite treatment before going out is her Eye Rejuvenation treatment. It instantly removes bags and gives you an eyelift, it’s like magic! This treatment uses non-invasive technology from Viora. Marina’s approach to skincare combines a European tradition of aesthetics with cutting edge technologies. Clients can opt for a variety of unique and innovative treatments such as a Brazilian Buttock Enhancement and Cellulite Reduction treatment, Love Handle Firming, Hollywood Legs or even a Velvet Breasts therapy the choice is up to you. Apart from that they also have various skin, body and facial treatments too. Plus, some of the best pricing in the city! This is one of the hottest beauty spots in Toronto. Owner Joel Dart was fascinated by the apothecaries all over the world and that’s where the idea was generated to bring back something inexpensive to Toronto as well. As a result, Jacob & Sebastian is thoughtfully stocked with beauty, skin and bath products that aren’t normally on the shelves of drugstores. For them the unique selling factor is that they are more of a gallery than a store. This is your one stop destination for all your skincare needs. From skincare, body care, haircare, makeup, fragrances and home care too they have it all. You can shop all the products online and also at their store in Queen West area. From niche brand to luxury and budget brands they have a fit for everyone’s needs. Tony Pham is the mastermind behind Toronto’s ‘it” salon LAC+CO a conceptual lifestyle boutique salon. The story goes that he was supposed to be in the hospitality industry, but he had no interest. He knew he loved beauty and fashion, so he decided to become a hair stylist and colorist. They have been featured in Vogue, The Coveteur and Allure to name a few. They have a wide range of haircare products and offers services for hair styling and cutting for both men and women. They have selections of Tom Dixon and MAD et LEN fragrances and candles which is a Parisian brand, Joanna Laura Constantine and Pluma Italia jewellery are hand-picked to suit the clientele. Her Majesty’s Pleasure is global award-winning salon/spa and cocktail bar located in the King West Village Fashion House. Elegantly designed beauty bars offer sensory beauty services while bartenders serve creative cocktails, champagne and sweets. They offer an array of beauty services, but we love their manicures and pedicures! They have special packages and unique experiences for groups including bachelorette parties, birthdays, bridal showers and corporate bookings are also available.Specialties include their signature manicure and pedicure where guests can have their nails done at the marble manicure bar, recline in a Muskoka chair for a pedicure. They are also set to open their second location in Yorkville. So get on your shoes and head out for your ultimate beauty revival! Who doesn’t love good and clear skin. A blemish free and glowing skin is what we all thrive to achieve. But unfortunately, good skin and skincare regimens take a lot of time and patience and also becomes expensive in today’s date. With so many options to choose from the consumer often gets confused as to which will be the best for their skin because different people have different requirements. I remember as a child growing up in the hot and humid climate of India was a daily struggle for me in terms of skin and hair issues. I wasn’t born with great skin and was always prone to acne and dryness throughout. I’m 25 years old now and lately I have started to take good care of my skin. I invested in good quality skin products and have been following a strict daily skincare regimen. Thanks to my work which involves being in the beauty and fashion industry I am always on the eyes of my peers and general public where looks matter the most. Also working in this industry means getting to know newer brands who are upcoming yet have created a mark for themselves already. One such brand is 23 years old which I was introduced to recently. 23 years old is a Korean beauty brand who believes in the philosophy of providing good quality beauty products for both men and women that can be easily followed at home and helps maintain healthy skin. The brand essence revolves around the number 23 as their products are designed accordingly. Each product is tested 123 times and naturally revitalizes skin after 23 days. They have a wide range of products to choose based on your skin needs – facial masks, cleansing, skincare, seasonal care, special care. From bubble masks to exfoliating masks they have it all. The main three bestselling products are from their masks and the cleansing line. 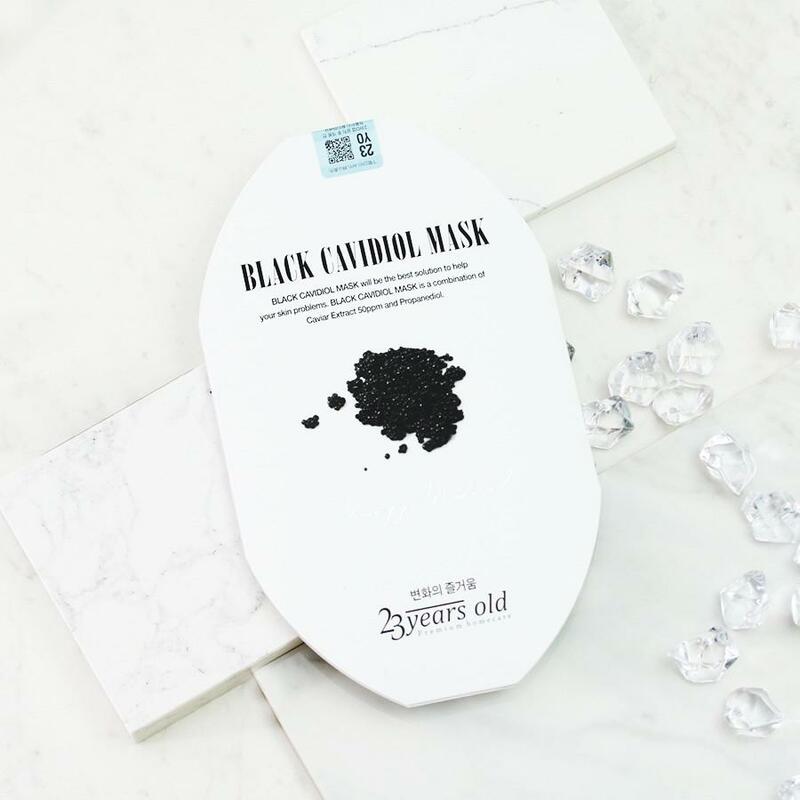 I tried The Black Cavidiol Mask (US$18 for 3pack) personally. It has ingredients like Caviar Extract, Pearl powder and after taking it off I did see a good change in my skin in terms of hydration and glow. The second bestselling product is their Seaweed mask (US$ 3.90) which is known for cooling effects and protein replenishment features. 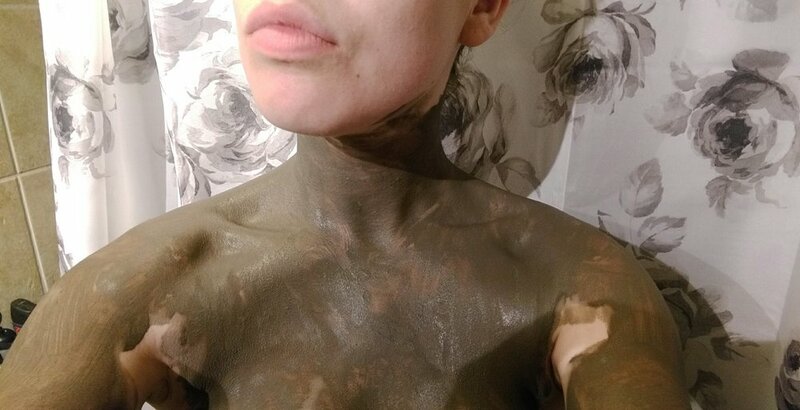 And lastly their Black Paint Rubar (US$19.50) is targeted for removing makeup and black/white heads. Thus, 23 years old will be a big name in the beauty industry in the near future and prove to be a tough competitor for other similar beauty brands in the market. I love to go to the spa when I get a chance, but I have to say the Four Seasons Spa in Toronto blew me away! First, I was met by the incredibly friendly staff who ushered into the men’s change room. I was given a quick private tour. Then I got into my robe and went to the chill room before having my massage. Jeff the massage therapist met me, again super friendly. I did the 60min Asian Fusion Massage with an add on of Instant Anti-Puffy Eye & Wrinkle Treatment. WOW! This massage is honestly the best massage I’ve ever had. I’ve tried them all, hot stone, deep tissue etc. but this one takes the cake. The fusion of pressures mixed with stretches and light movements really feels amazing. This is one massage I will go back for 100%. Plus, the puffy eye treatment was great, my eyes felt rejuvenated and were less puffy at the end. After Jeff was done I got to explore the spa and really detox. I spent time in the steam room which had essence of eucalyptus I think? It really cleaned out my sinuses and detoxed my body for sure. I drank lots of lemon water. Then I put on my robe, swim suit and headed to the swimming pool, wow! It even has music in the water so when you duck under you can hear it, so cool. The hot tub was huge and amazing as well with strong jets that continued to massage my body even more. I also got to watch the sunset on the balcony (see my picture below), and then returned to the hot tub and finally back in for one last steam before going home. I left with the biggest smile on my face and have never felt so fresh and rejuvenated. I was ready to take on my Friday! I would highly recommend going to the spa and do this massage and lounging around so you can enjoy their amazing amenities, you’re going to love it.